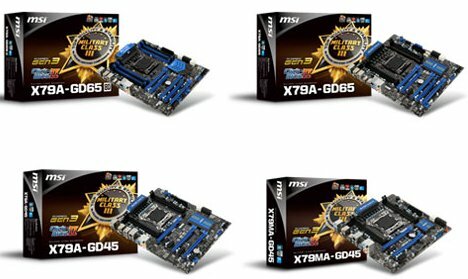 Leading international mainboard and graphics card manufacturer MSI today announces the official release of its X79A-GD65 (8D), X79A-GD65, X79A-GD45, and X79MA-GD45 mainboards. The new mainboards are based on Intel's latest X79 chipset and uses the LGA 2011 socket supporting the 2nd generation Core i7 processors. The X79A-GD65 (8D) features with 8 memory DIMMs, supports 16GB DDR3 memory modules, bringing maximum capacity up to a staggering 128GB! For superior quality and stability, MSI X79 series mainboards adopts Military Class III components. With DrMOS II - the next generation of DrMOS with improved double thermal protection - the lifetime of components is maximized, even in warmer environments or when the machine is heavily overclocked. MSI X79 series mainboards also feature the latest PCI Express Gen 3 bus and MSI's proprietary Click BIOS II for maximum performance and user convenience. When taking into account all of the other advanced technologies supported such as 3-Way NVIDIA SLI and 4-way AMD CrossFireX multi-GPU processing technology, THX TruStudio PRO sound, Multi-BIOS II, Control Center II, and Super Charger, MSI X79-series mainboards are simply the best choice for enthusiasts! MSI X79 series mainboards maintains MSI's commitment to product stability and reliability by introducing Military Class III components. In addition to the use of Tantalum core capacitors (Hi-c CAP), Super Ferrite Chokes (SFC) and Solid Capacitors (Solid CAP), MSI now incorporates next-generation DrMOS II design. While competitors are just beginning to adopt a DrMOS solution, MSI's DrMOS II provides an integrated and fully-automated Double Thermal Protection to maximize the lifespan of components – even in warmer environments or when heavily overclocked. All Military Class III components have passed MIL-STD-810G certification, making MSI's Military Class III components synonymous with premium quality and ultimate stability. MSI's X79 mainboards support the latest PCI Express Gen 3 standard to deliver a staggering 32GB/s of bandwidth, double that of the previous generation. PCI Express Gen 3 support can also be enabled or disabled through the BIOS interface to ensure compatibility with graphics cards regardless of whether users use a PCI Express Gen 3 graphics card! MSI's Click BIOS II is the world's 1st to provide a unified graphical user interface under both UEFI & Windows. System settings can be adjusted using the mouse or even LCD touch control under different environments. Click BIOS II can not only save overclocking settings to a USB storage device but also upload them for sharing with other overclocking enthusiasts. This convenient and intuitive design is the result of continual technological breakthrough developed by MSI for its flagship mainboard line. MSI's proprietary OC Genie II can achieve amazing performance increases in just one second. CPU and memory performance are optimized without compromising system stability, significantly saving the time required by overclockers for fine-tuning. Once the user enables OC Genie on MSI's X79 mainboards, the clock rate on the Intel Core i7-3960X Extreme Edition processor pumped from a default of 3.3GHz to 4.0GHz. The 21% increase enables users to enjoy the performance boost from overclocking with ease. MSI X79 mainboards fully support 4-way AMD CrossFireX and 3-way NVIDIA SLI multi-GPU processing technologies, providing the most scalability and performance for gamers who require extreme gaming performance. MSI X79 series mainboards are all equipped with THX TruStudio PRO audio technology for the best sound quality. Experience the most immersive surround sound effects when you are watching Blu-ray movies, other media, or playing 3D games! MSI's X79 mainboards support the latest Multi-BIOS II technology. The integrated dual BIOS design improves safety and convenience by allowing enthusiasts to use a switch on the mainboard to manually switch between different BIOS setups when one is corrupted by overclocking or other factors. Super Charger Charges Your iPad / iPhone / Smart Phone, Even When Computer is Powered Off! MSI's X79 mainboards support Super Charger fast charging technology to deliver triple the current of standard USB 2.0 interfaces. Even if your computer is switched off, you’ll still be able to quickly recharge your iPad/iPhone or smart phone to ensure you always stay connected!